HTC is throwing its hat into the phablet ring and it appears that its sleeping giant is set to awaken on Verizon’s network, but not before smiling for the cameras. 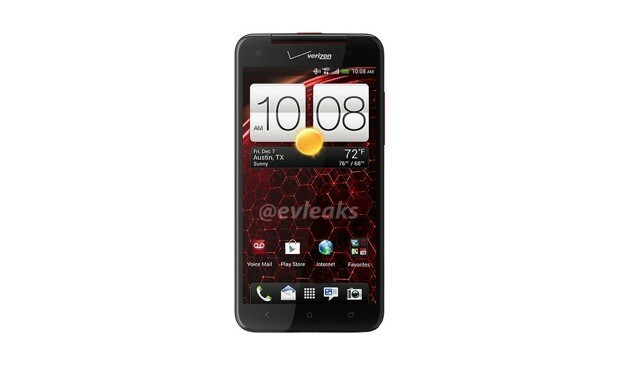 Pictured above is a press shot of the highly anticipated Droid DNA, which is believed to be Big Red’s stateside rendition of the 5-inch Super LCD 3, 1.5GHz quad-core Snapdragon-toting J Butterfly. While this device has generated quite a buzz, it remains to be seen if this Japanese behemoth’s red, white and blue counterpart will ship with identical hardware. Thankfully, all should be revealed soon, as Verizon and HTC have scheduled a get together later this month in the Big Apple and of course we’ll be on hand to bring you all of the gory details, no matter how difficult to handle. Verizon-bound HTC DNA gets up close and personal in its latest press photo originally appeared on Engadget on Tue, 06 Nov 2012 17:38:00 EDT. Please see our terms for use of feeds. There’s apparently more to life for Mophie than power packs, as the accessory designer has pushed its first Bluetooth headset, the Powerblu, through the FCC. In a shock to no one, the stand-out is a separate charging station to keep the earpiece going well past what its internal battery can manage: where the headset normally lasts for four hours of talk on its own, that lifespan grows to 30 when it’s periodically revived through the mothership. Other traits will be familiar to anyone who’s used to wireless earwear, whether it’s a noise-cancelling microphone array, text-to-speech or voice commands. About all that’s left after what we’ve seen is for Mophie to seal the deal with a formal launch. 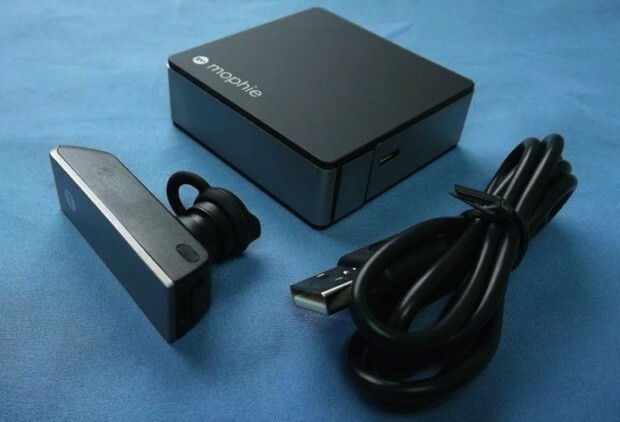 Mophie Powerblu Bluetooth headset sneaks through the FCC originally appeared on Engadget on Tue, 06 Nov 2012 16:47:00 EDT. Please see our terms for use of feeds. If you’ve ever cussed out your DSLR because your still shots or video had excessive aliasing, jello and noise, you might be happy to hear about the new Coach16 imaging chip from CSR. The new addition to the ex-Zoran line of imaging processors is aimed at DSLRs and mirrorless cameras, and for the cinema set brings 1080/60p HD video with ‘super-resolution’ RGB downscaling to eliminate aliasing caused by line-skipping. Still shooters would get “endless sustained burst” high frame-rate capability, multi-frame noise reduction for improved low-light shooting, USB 3.0 support, high resolution EVF capability and smart flash. The latter feature cleverly takes two pictures rapidly with and without a flash, then marries the best parts HDR style for the final image. We won’t see any of that until it gets released in a new DSLR model, of course, but meanwhile, you can dream with the PR below the break. 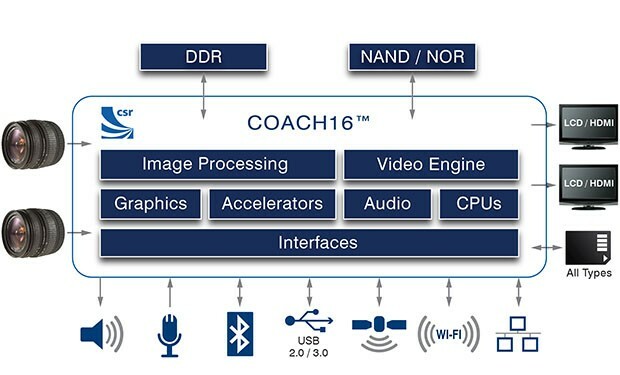 CSR outs new Coach16 processor for high-end cameras, aims to kill video jaggies, noise originally appeared on Engadget on Tue, 06 Nov 2012 15:56:00 EDT. Please see our terms for use of feeds. This entry was posted on November 6, 2012, 5:39 pm and is filed under Mobility. You can follow any responses to this entry through RSS 2.0. Both comments and pings are currently closed.